Great stuff. Takes a bit to get it right, so start on a small piece of trim. Go slow, and don't pull too tight. Make sure you line up the edge of the tape with the rubber piece on the top as it's easy to use a credit card to wrap the piece underneath the bottom piece of the trim. This makes sense once you're doing it! MINI Cooper S replacement Belt Tensioner Assembly. Perfect fit. This is an aftermarket part but when inspected directly next to a factory MINI part we found it to be identical in every way- including stampings in the various metal parts, springs, reference numbers, etc. 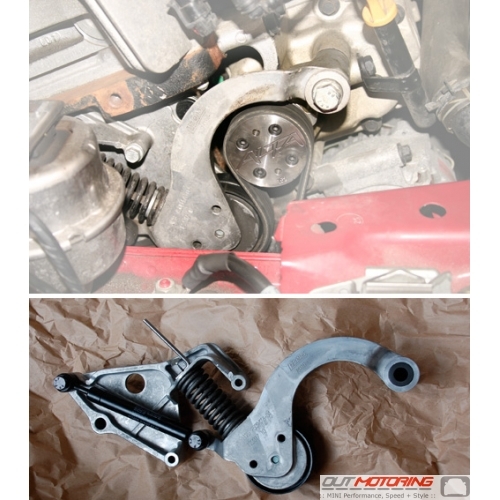 Or check out the factory MINI Belt Tensioner Assembly by clicking here.